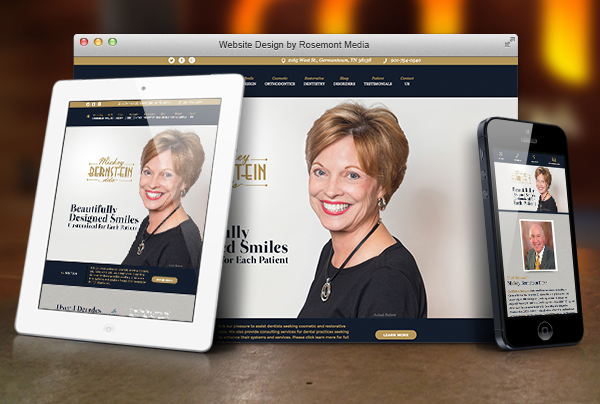 Memphis cosmetic dentist Mickey Bernstein, DDS recently collaborated with Rosemont Media to develop a new design for his dental website. He worked closely with our team of developers and designers to create the aesthetically appealing design, and now the website is enhanced to help patients find the information for which they are looking in a more user-friendly format. Dr. Bernstein’s updated site was developed as a responsive website design. This means the layout adjusts automatically to better fit the screen of the internet device being used to access it. Whether a person is viewing the website with a laptop, desktop computer, smartphone, or tablet, the formatting will resize to the appropriate dimensions of the device. This advanced feature provides a more convenient viewing experience, as patients can utilize the dental resource on various devices without having to scroll across the page to see the extent of the content. With the new dental website design, Dr. Bernstein can easily educate patients on such treatments as dental implants, porcelain crowns, Invisalign®, and teeth whitening before their initial consultation. Furthermore, the upgraded website is now equipped with the latest dental SEO strategies to help increase its visibility on leading search engines. To view an example of the type of custom dental website design Rosemont Media can develop, please visit www.mickeybernsteindds.com.